In honor of Throwback Thursday, DME wanted to take a closer look at some wedding dress styles from the past. Although some of these styles may seem outdated, or even a bit traditional, they were the "it" styles back in the day! If you're looking for a unique wedding dress, opting for one of these throwback styles might be just what you're looking for! This throwback style is from way back when! The 1930's style wedding dresses showcase a lot of the styles that were a big part of the Roaring Twenties. The "flapper" dress was the "it" dress of this era, which you can see in some of these dresses. Also - notice the head pieces? Those were huge for this time period, and have almost vanished since then! Now, its all about veils, a flower, a thin headband, etc. This throwback style, paired with the right dress, could be a beautiful accent piece to your entire look. Our second throwback style is from the 1950's and one that you don't see very often in the present day. It's your classic 50's look; very classic and traditional. 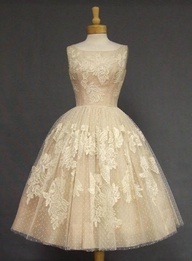 The style from this era was a cinderella-style dress that stops mid-calf, and if you ask us - it's absolutely fabulous! This style dress would be perfect for a summer or beach wedding where it is not a heavy weighing gown. Also, this style allows your guests to see whatever fabulous shoe you've chosen to wear on your big day! It's a win-win if you ask us! Our third throwback style is the sleeved wedding dress, which seemed to be most popular throughout the 60's and 70's. Although there are some brides who love this look, it's definitely not the most common anymore. 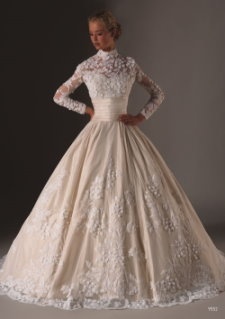 All you brides-to-be, take a look at your mom's wedding dress - it probably has sleeves! You can see how many different styles you can have with a sleeved dress. You can have a high neck line, low neckline, open back, etc. Also, if you feel like full sleeves are too much, you can opt for a half-sleeve to still maintain that classic look. All of these throwback styles are unique and fabulous. They all serve a completely different look from each other, but are all classic and traditional at the same time. Do you think these styles will make a comeback? We certainly do!